They haven’t (yet) perfected how to reproduce the aroma of new leather interiors, but there is no doubt that taking the car showroom experience onto the internet is growing in popularity. Car buying online, after stalling a few years ago, is now heading into top gear. We’ve become used to click-to-buy products over the past few years. Online shopping was never going to be a fad and is now close to being the norm. With more than £77 billion of online sales in the UK alone over Christmas, it’s clear that mobile devices have taken online shopping to unprecedented levels and there is little doubt this will continue to increase. Consumers demand immediacy, whether they are on the bus or on a lunch break – wherever they happen to be. Businesses must provide the ‘anywhere, anytime’ option, because if a competitor does and they don’t, it’s not hard to guess what will happen. It’s so easy and addictive. Who hasn’t bought a book off Amazon, or clothing from Next or a present from John Lewis? Almost all the major supermarkets offer shopping delivered to your door or ‘click and collect’. So that’s food, books, clothes . . . but what about cars? No . . . surely the browse around the showroom, the sitting inside and imagining that flash new Ford Mustang is yours – and the smell . . . ah, the smell of new leather and brand new fittings! Nothing can beat that experience, can it? Well, it seems something can: car buying online is steadily increasing and major brands, perhaps a little late to the party, are finally taking the whole process seriously. 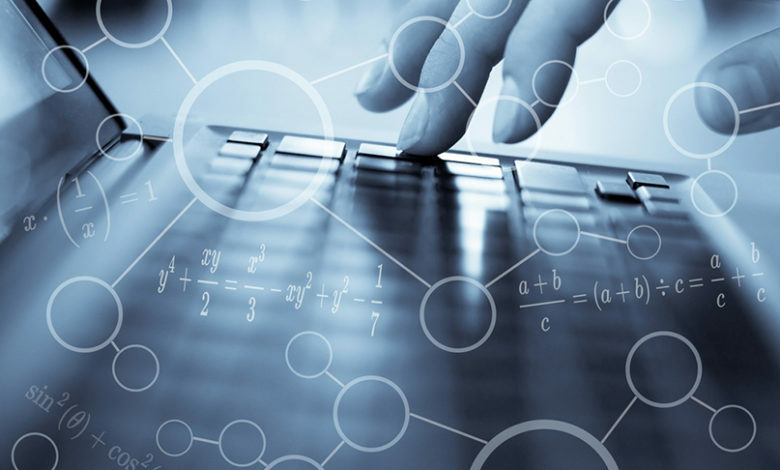 Sophus3 specialises in data exchange for the automotive industry and, via our analysis and statistics, we are helping the industry understand and act upon our findings. Representing the world’s biggest car manufacturers, we maximise raw data and customer behaviour, highlighting the demands and trends of the consumer. And our first step to innovation is reducing uncertainty to acceptable levels – via data driven solutions and insight. 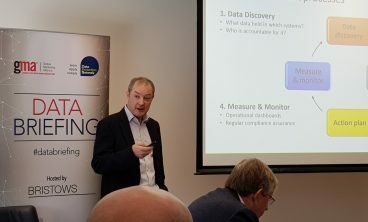 As hosts of the eDataXchange – the officially mandated digital market intelligence source for major auto brands in European markets – Sophus3 has presented a forum which has become increasingly vital to understanding the latest innovations and shifts in the automotive industry. Our findings show that, now more than ever, by understanding data patterns, auto brands will be better prepared for what is a constantly shifting landscape. At our 2017 Forum, the key message to manufacturers was the need to provide an option to buy cars online with virtual showrooms set to become a standard requirement. The automotive industry has largely resisted the online purchase option for many years, perhaps due to numerous bad experiences during the dot-com boom. It seemed buying cars online was a step too far, no matter how popular online purchases and services were becoming – cars are cars and the digital world is the digital world. And never the twain shall meet. 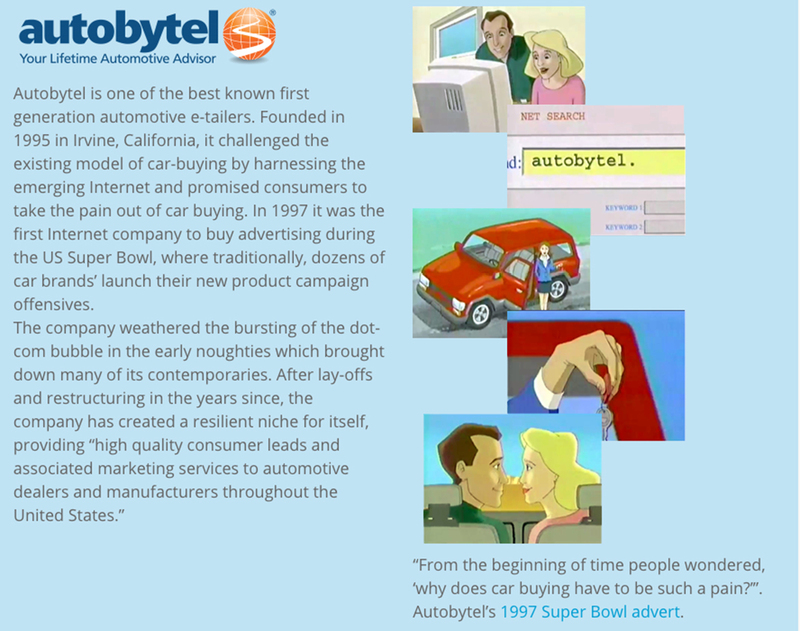 The internet boom in the late 1990s saw the spectacular rise and fall of several opportunist companies hoping to cash in and sell cars online. Autobytel, CarsDirect, CarPoint, DealerNet and many other start-ups promised US consumers that they would ‘take the pain’ out of buying a new car. Unrealistic expectations and economic downturn saw these dreams evaporate when the dot-com ‘bubble’ began to burst in 2000. But times change and so do consumers. The customer journey is a lot smoother these days and the general attitude is that if you can buy virtually everything else on line, why not cars? Why not indeed . . .
A new wave of automotive ‘e-tailers’ has entered the market in recent months, clearly sensing an un-met need. However, there are also an increasing number of automotive brands determined to keep pace with these disruptors, setting up their own online retail process. This is where it gets interesting – and, of course, this is where Sophus3 comes in. The question that first needed addressing was, what put people off to begin with? It seems the bigger the purchase, the more reticent consumers were to part with their hard-earned cash. Plus, as I said earlier, that physical experience was absent and, after all, isn’t that half the fun? Then there was the negotiation process – you can’t ask a website to “Throw in the carpets and you’ve got a deal”, can you? However, the consumers of today, however, think differently from the established industry wisdom. 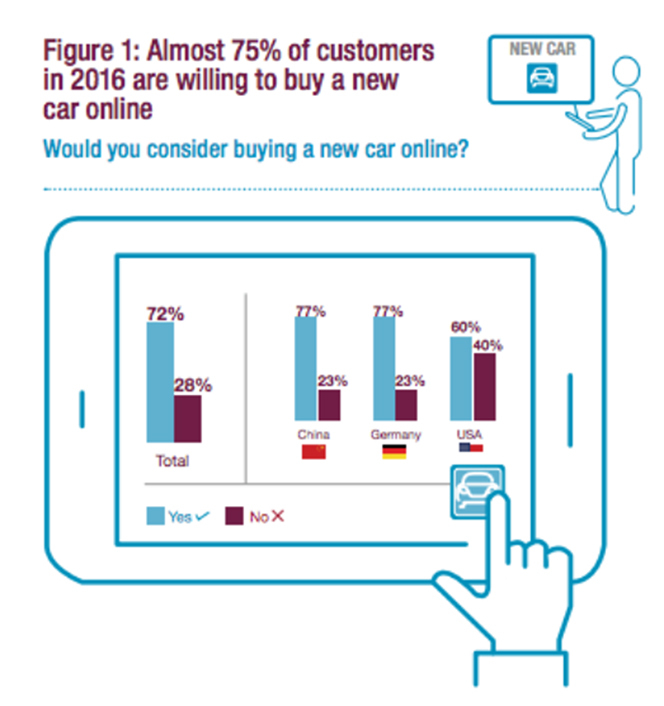 Ten years ago, when the Cap Gemini annual ‘Cars Online’ survey first asked the question, it found more than 18% of respondents said they were ‘likely to buy a car online’. When the question was repeated in 2016, around 75% of consumers in Germany, the US and China indicated they would be willing to do so. A more recent study, published by Roland Berger in January 2016, states that 97% of car buyers now use the Internet to research vehicle purchase and that as many of 44% of them would buy online. So, what’s changed? There have been several important changes in consumer behaviour that help explain the growing readiness of people to consider purchasing their next car wholly online. Time is at premium for so many, with our busy lives packed to bursting, so the ‘always open’ option has huge appeal. Most car showrooms operate during normal working hours, so how’s that going to fit in with consumers’ busy lifestyles? And, if their weekends are as packed as their weekdays, the showroom experience isn’t all that it might once have been. It’s all about time, convenience and immediacy. Consumers also prefer to explore their options at their own pace, free of the sales pressure of the traditional retail environment. Car buyers’ negativity about the dealership experience appears to have only worsened in recent years. And consumers don’t need convincing a car is safe and reliable any more – that’s a given in the world we live in and warranties provide a suitable safety net. Finance can be done in a few minutes and the rise in popularity of Personal Contract Purchase (PCP) deals mean that with future values guaranteed, there is little worry of the ‘haggle factor’ – another boon for the online buyer brigade. OK, there is surely one bastion of real-time experience that could never be satisfactorily replicated – the test drive? Not so. VR technology, video and online chat channels pretty much cover that, too, it seems. The smell of new leather, alas, is yet to be catered for, but no doubt they’re working on it! Ford certainly made strides ahead when it used live chat to boost the pre-orders of the new Mustang in December of last year. MAY 2017 UPDATE: Sophus3’s quarterly study into how consumers are accessing information from major car brands and the device of choice points clearly to mobile phone technology. The only European country to have a slight majority in ‘conventional devices’ is Germany, with 51% (a narrow majority) still preferring laptops and PCs. The UK and Spain lead the way with mobile use for accessing car websites and though the UK leads in tablet use for the same research, this is declining as tablets gradually become less relevant, due to the capabilities of smartphones. The speed of this change has perhaps surprised the automotive industry. 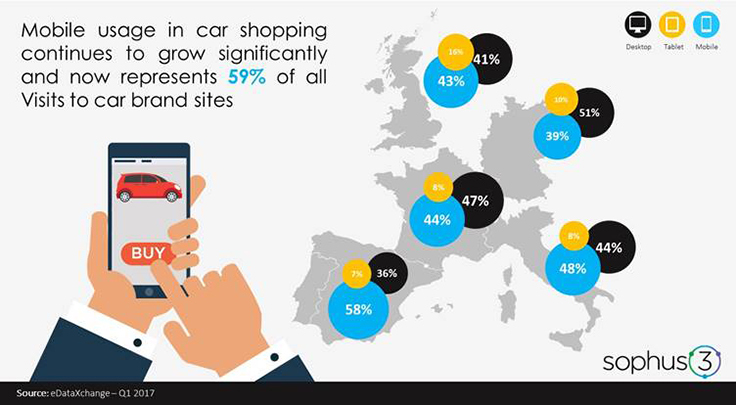 Mobile usage for car shopping in the UK continues to grow quickly and now represents 59% of all visits to car brand sites. With more than 50% of all visits to car brand websites in 2016 coming via mobile devices and tablets, auto brands are under intense pressure to make their platforms mobile-friendly or risk losing consumer interest. The need to optimise the digital showroom experience with a move towards guided selling is another key finding revealed at our 2017 Forum. 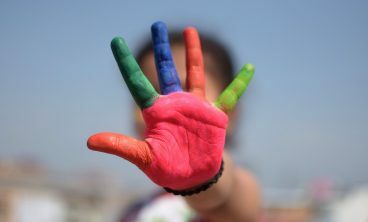 With flexibility and immediacy key to progress, a shift away from traditional values and the ability to think outside the box will become the norm rather than the exception. BMW, Hyundai and Peugeot have all launched ‘digital stores’ which allow consumers to come close to allowing the consumer complete the entire transaction online. Auto dealers like Vertu also offer their customers the facility to conduct most of the purchase online. The UK car market faces a tough year ahead due to economic and political uncertainty. Car brands and their digital teams must prepare for the approaching waves of disruption or risk being swept away. The digital consumer journey is marred by hurdles of inconvenience: mobile must be prioritised first and the small screen experience reinvented. Other industries have been forced to change and innovate – automotive hasn’t had to, but it does now. Click to buy is a step towards a transactional mobility future where a large proportion of consumers will use their mobile device to buy mobility, when and where they need it. The customer, not the automotive industry, will define the future of the automotive industry. Perhaps the most important statistics and data concern the need for the automotive digital experience to reinvent itself for the mobile phone platform. With more than 50% of all visits to car brand websites in 2016 coming via mobile devices and tablets, auto brands must make their platforms mobile-friendly or risk losing consumer interest. Visitors via mobile device bounced on the first page twice as often as when they visit from a desktop – an impressive if not entirely surprising statistic. With the peak of car brand visits on Sundays and half of completed test drives occurring on a different car brand than where the journey started (according to recent Capgemini research), enabling and helping the visitor to take immediate purchasing steps via a direct sales portal will be a digital game-changer. With consumers spending less and less time on car brand sites (the average dwell time is 2 minutes 51 seconds), generating relevant content increases site engagement and, if that content is user-generated, it helps build trust. 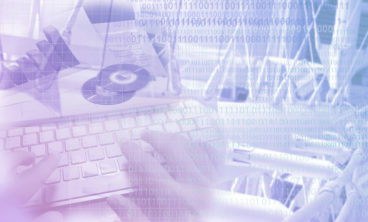 Financial transactions and getting them right are one of the industry’s biggest immediate challenges. Click-to-buy cars isn’t the future – it’s already happening. What’s the future of retail – visualisation? Scott Gairns graduated with a Master’s degree in Business Administration from the Rennes Business School in France and a Master in Marketing from Laval Business School in Canada. His specialities are the auto industry, media, financial services, digital marketing, mobile marketing, social media, CRM and business intelligence. 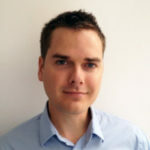 In addition to managing Sophus3 operations, Scott also spearheads Sophus3’s engagement services development activities. His career has included being a digital manager for Société Generale and he has also worked as a marketing manager for AGF. One of his first roles was as a consultant for Capgemini between 2002 and 2004.